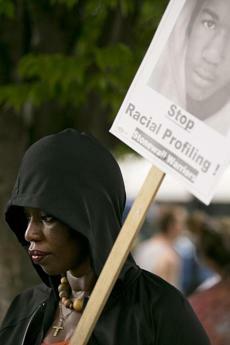 Cathy Guild, 47, of Roxbury held a sign and wore a hoodie in memory of Trayvon Martin during a protest by the Occupy movement in Dudley Square Plaza in Roxbury after George Zimmerman was acquitted in Martin’s killing in Florida. 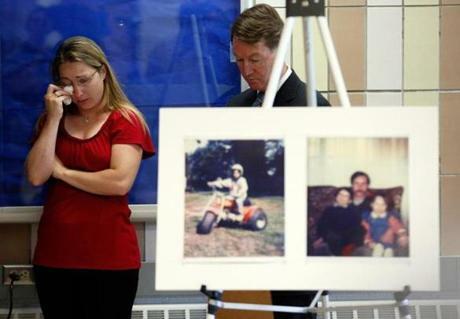 Jamie Lusher's sister Jennifer Nowak, 38, of Westfield wiped away a tear as she stood next to Berkshire District Attorney David Capeless during a press conference about the investigation into her brother’s 1992 disappearance. Convicted killer Lewis Lent recently confessed to killing Jamie and told authorities where to look for his body. The body of confessed Boston Strangler Albert DeSalvo were exhumed from his grave at the Puritan Lawn Memorial Park Cemetery in Peabody in order to get a DNA sample for testing. 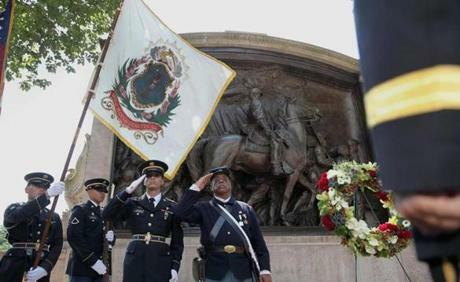 A wreath was placed in front of the Robert Gould Shaw Memorial opposite the State House in Boston to mark the 150th anniversary of the Battle of Fort Wagner in South Carolina, where members of the Massachusetts 54th Volunteer Infantry battled Confederate forces. 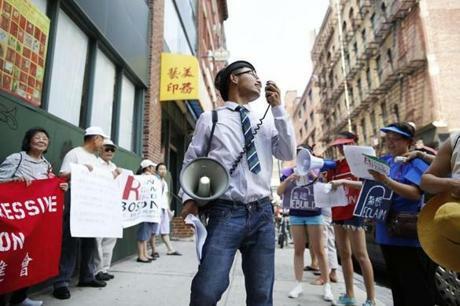 Changling Zhang, 18, of Malden played the role of the developer during a rally calling attention to an increasing shortage of affordable housing in Chinatown. Friends Laurie Bent, left, and Emily Hutcheson strolled in the woods near Hutcheson’s Weston home. 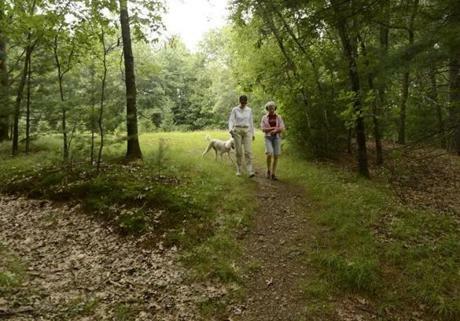 Bent dressed to prevent tick bites, and brought her dog Maisie, whose white coat makes it easy to spot the ticks that cause Lyme disease. 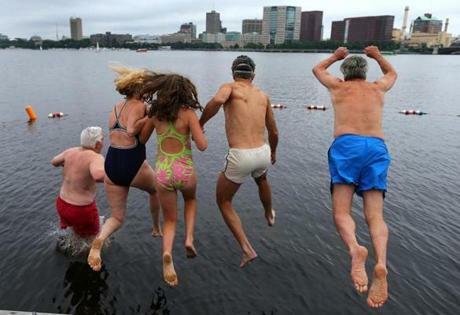 The Charles River Conservancy hosted the first public swim in the Charles River in 50 years, as participants took the plunge at a boat dock near the Hatch Shell on the Esplanade. 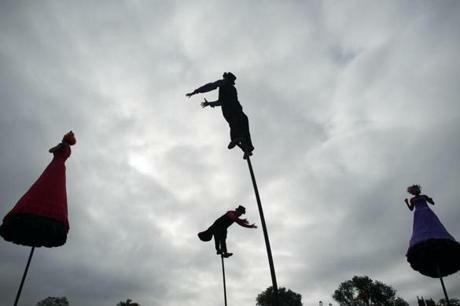 Members of Strange Fruit, from Melbourne, Australia, performed on tall poles during the Outside the Box Festival on Boston Common. Adam Steffler worked on 300-pound blocks of ice during construction of the Frost Ice Bar at Faneuil Hall. 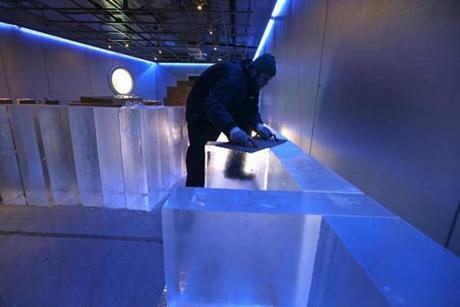 The world’s largest indoor ice bar, set to open Aug. 15, is being built by Iceculture, a company from Hensall, Ontario. 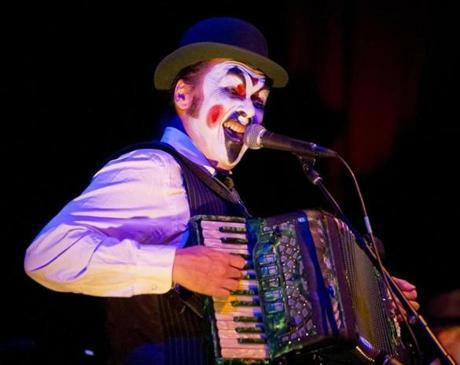 Martyn Jaques, lead singer with the Tiger Lillies, performed at the Oberon. 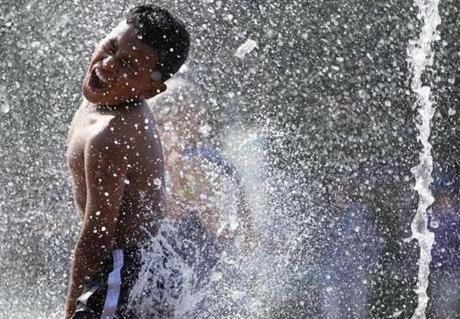 Orlando Emilino, 9, of Jamaica Plain played in the fountain on the Rose Kennedy Greenway. 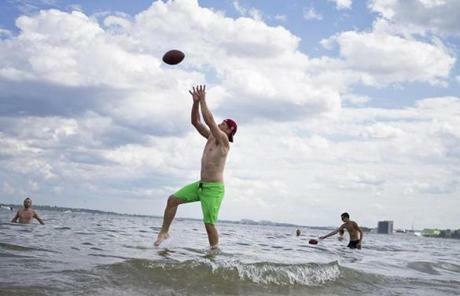 Craig Dwyer of Boston caught a pass from Greg Berman, not pictured, at Carson Beach in South Boston, where they went to escape the week’s long heat wave. 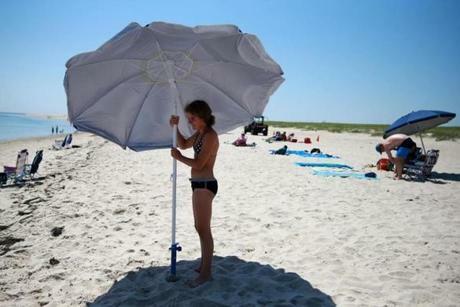 Noor van der Loo set up an umbrella at Lighthouse Beach in Chatham. Several great white sharks have been spotted near the beach this summer. Lisa Centio of Boston protested as Jose Bina of Cambridge joked that he would drop her into the water at Pleasure Bay in Dorchester. 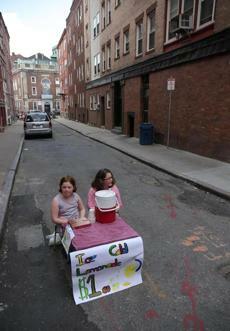 Sisters Rebecca and Brianna Woods set up their lemonade stand at Baldwin Court in the North End to wait for customers.